Still from Marcus Fjellström’s Odboy and Erordog. Image courtesy of Forest Collective. Forest Collective’s “Moonfall” programme explored two important aspects of the Metropolis festival’s theme, “Music inspired by the moving image.” Firstly, Forest Collective recognised the importance of computer games to any discussion of music and the moving image today. Secondly, the concert was downright creepy. Without culturally- and physiologically-ingrained harmonic cues, contemporary music can fall into an emotional binary of anodyne lyricism and anger. Humour and fear are like lyricism and anger’s more sophisticated cousins. Without wanting to be prescriptive (a piece need not aim for any of these emotional modes, nor any emotional mode at all), humour and fear show that a composer has enough command over their work to shape a complex audience experience. In film, the same distinction could be drawn between a slasher film that relies on loud and sudden noises to disturb the audience and the unnerving qualities of, say, a Tarkovsky film (more about Tarkovsky in a forthcoming review of the Melbourne Symphony Orchestra’s first Metropolis programme!). Forest Collective built their programme around Marcus Fjellström’s triptych Odboy and Erordog (available on Fjellström’s Youtube channel). Each episode reflects the sequential, task-driven atmosphere of certain nightmares. Odboy and his trusty Erordog embark on foreboding journeys to perform arduous “chores.” As in nightmares, the imperative to perform the tasks is overwhelming while the meaning of the tasks is obscure. The journeys will be familiar to all retro gamers and light-sleepers, including “finding the big house” and “crossing the spider pit” while “looking out for the wild boar” (echoes of Conquests of Camelot?). The first episode includes an electronic score by Fjellström utilising rhythmic record pops and theatre organ that complement the grainy black-and-white video. The second two episodes include written scores for the ensemble, who provided a sparse layering of extended techniques and musical accents. Fjellström is currently working on what appears to be a sci-fi chamber opera entitled “Boris Christ.” Hopefully we can get it over to Australia (Forest Collective I’m looking at you). 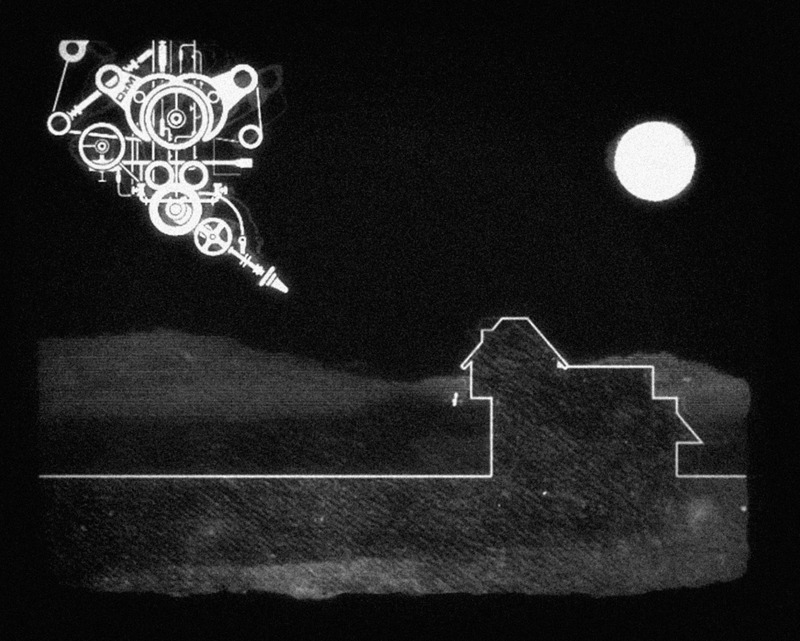 Odboy and Erordog combines black-and-white film aesthetics with 1980s computer-game graphics. Computer games form an essential part of screen culture for anybody under the age of forty. While those who did not grow up with computer games may recognise the burgeoning computer game market, those who spent too long in front of screens as children will understand the emotional resonance of old, lo-fi computer game aesthetics. If I may indulge in some folk-psychology, perhaps this is because an active imagination is needed to turn a few blocky pixels into a whole fantasy-world. On the other hand, the stark colour contrasts and blocky designs of old games have design elements unto themselves that are, for want of a better word, beautiful. Forest Collective threaded a series of dark and foreboding chamber works between the Fjellström films, beginning with Evan Lawson’s arrangement of Rupert Holmes’ song “Moonfall” from the 1985 musical The Mystery of Edwin Drood. The musical is based on an unfinished novel by Charles Dickens and was the first musical to feature multiple endings, which were chosen by an audience vote. Lawson states in the programme that he wanted to capture the “smoky streets of nineteenth-century London.” He certainly achieves this goal with a murky bed of clarinets (Vilan Mai and Aaron Klein) and shimmering string tremoli. Forest Collective’s dark programme triggered a series of questions surrounding horror and music. While sudden, high-pitched and dissonant sounds may appeal to our fundamental survival instincts, how do we process subtler unsettling sounds? If we are taught to recognise certain sounds as “creepy,” then how can we access the emotional impact of creepy music from throughout history? What is the first recorded piece of “scary” music? Marcus Fjellström, Odboy and Erordog; Rupert Holmes (arr. Evan Lawson), Moonfall; Evan Lawson, Orpheus in the Cave.